This bestselling volume is now available in a fully updated and expanded 3rd edition, bringing together 361 readings drawn from 233 different sources, and charting the 2,000 years of Christian history. bull; bull; Each reading illustrates a key doctrine, point of view, intellectual development, or theological landmark bull; Exceptionally user-friendly: every reading is accompanied by its own introduction, commentary, and study questions bull; Features increased coverage of Catholicism, Orthodoxy, and women writers, and includes important sources from patristic, medieval, reformation, and modern periods bull; A new section provides a birdrsquo; s-eye view of the historical development of Christian theology, allowing users to locate a reading against its historical context bull; Additional writers featured include: Yves Congar, Walter Kasper, Bernard Lonergan, Bonaventure, Duns Scotus, Stanley Hauerwas, John Paul II, C. S. Lewis, Maximus the Confessor, Rosemary Radford Ruether, Dorothee Souml; lle, Dumitru Staniloae, and Rowan Williams. Whether used as a free-standing resource, or as a companion to various introductions to theology, including McGrathrsquo; s market-leading textbook, Christian Theology: An Introduction 4th edition, this Reader is the most comprehensive, accessible and inclusive book of its kind. 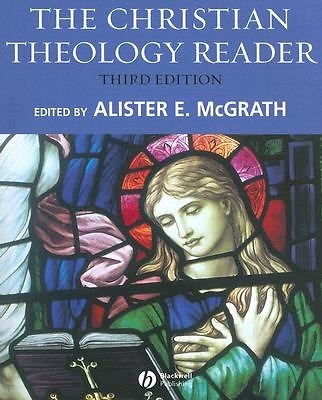 The 3rd edition is accompanied by a website at www.blackwellpublishing.com/mcgrath.